It is here…”Christmas” for Flag Dealers! Yep, the Flag Season has officially arrived. It started the week before Memorial Day, goes through Flag Day in June, and ends after July 4. My neighbors, the Blairs, are on it. 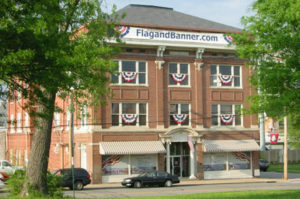 This week they decorated their old home with vintage bunting from FlagandBanner.com. They have a 1930 home with cream paint and red brick. The vintage bunting looks fabulous! People stop and ask them, “Where did you get the antique looking decorations and are they really old?” Dan Blair tells them he found it in the attic and it is from the first World Fair. Man he is a good B S’r. 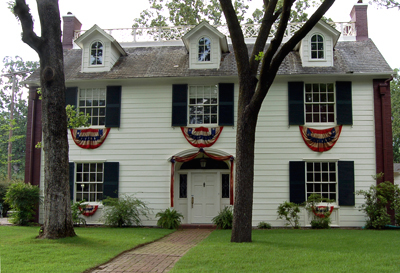 I put the traditional red, white and blue bunting on my house. There is so much to choose from now days, you can go crazy. But if you don’t want to make any decisions you can keep it simply by buying one of our many home decorating kits.